I wanted to bring some homemade ice cream to Ely's birthday party so I asked him what his favorite ice cream flavor was. "Strawberry and chocolate chip cookie dough," he said. As tempted as I was to add chocolate chip cookie dough to strawberry ice cream, I resisted, and ended up making the best strawberry ice cream I've ever tasted. I found the recipe on epicurious.com, and it was originally printed in the June 2001 issue of Gourmet magazine with the tagline, "Don't let the unexciting name of the recipe fool you—this ice cream is unusually good." I wondered what they meant by "unusually good", and I think they were referring to how the addition of a little citrus totally brings out the freshness of the strawberries, kind of like how cilantro brings out the freshness of savory dishes. Compared to other frozen custard recipes I've made in the past, this one had a lot more cream (no milk at all) and used the whole egg instead of just the yolks. I was afraid with that much cream it would leave a greasy coating on the tongue, but that didn't happen at all. I did substitute lime zest and lime juice for the lemon since I had a lime but no lemon. And instead of pureeing the strawberries in a blender, I used an immersion blender to mash the strawberries so as to leave chunks of fruit in the final product. Since I wanted the chunks, I wasn't able to strain the strawberry mixture to remove the seeds, but I don't think it really mattered at the end. Combine cream, zest, and salt in a heavy saucepan and bring just to a boil. Remove from heat and discard zest. Whisk eggs with 1/2 cup sugar in a bowl, then add hot cream in a slow stream, whisking. Pour back into saucepan and cook over moderately low heat, stirring constantly, until slightly thickened and an instant-read thermometer registers 170°F (do not let boil). Immediately pour custard through a fine sieve into a metal bowl, then cool to room temperature, stirring occasionally. Chill, covered, at least until cold, about 2 hours, and up to 1 day. While custard is chilling, mash strawberries with remaining 1/4 cup sugar and lime juice using an immersion. Stir strawberry mixture into custard. 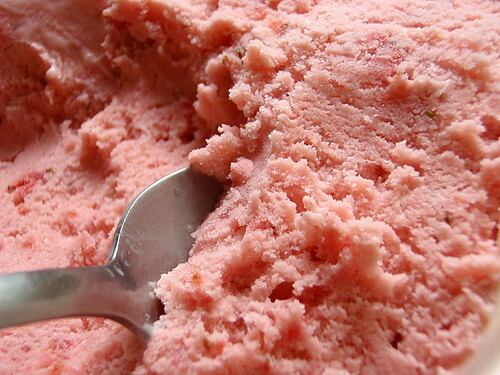 Freeze in ice-cream maker, then transfer to an airtight container and put in freezer to harden. thanks for bringing it--it was good stuff! did he like it? not usually a huge fan of fruit ice cream, but I'll take your word for it. Oh, bring on the strawberries! Delicious! 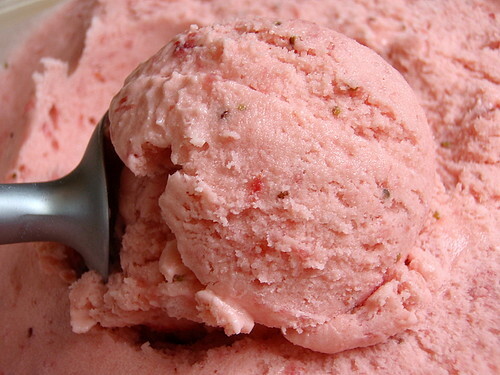 Great looking strawberry ice cream! My husband just made your recipe from strawberries we picked fresh. Absolutely fabulous! Thanks for sharing!